MISTAKE 1: SELECTING THE INCORRECT BOND FOR THE CONCRETE YOU’RE WORKING WITH. Once you understand how metal bond diamond tooling works, you can use the general rule of thumb when selecting the tooling for your job. Either way you end up wasting your time, and money, and your results will suffer. A common mistake an operator can make when feeling under pressure, is running the grinder at an unnecessarily fast speed. We tend to see this happening when an operator wants a faster production rate and will turn up the speed of the grinder in efforts to accomplish more in less time. However, this increased speed can overheat and “glaze over” your diamonds (especially on hard concrete) which prevents them from cutting properly, or at all (as mentioned earlier). To give you an example, our Predator grinder/polishers run a maxim drum speed of 1,200 rpm when dial set at 10 (full power). Although it can go 1,200 rpm if need be, generally it’s recommended to set the dial around 4.5-5.5 which runs the drum at approximately 600rpm. An operator can then adjust up a little or down a little to get the best performance. If you are operating a smaller machine (like the P-1800 & P-2400 for example) a Single Rectangle or single round will give more down pressure because you have double the square inch pressure, compared to a double round or rectangle; allowing it to cut faster. Opposite is true of the larger machines where a double segment will offer a better performance because it is grinding a larger space at one time. Although sometimes price isn’t always an indicator of quality (or lack thereof) when it comes to diamond tooling, it’s important to make sure that price isn't your only criteria of consideration for purchase. Poor quality diamonds wear faster, and inconsistently. They can scratch floors, and generally perform poorly, usually with limited or no support from the vendor. Buy from a trusted vendor willing to stand behind their products. This will save you time and money in the long run. A metal bond diamond will grind and polish almost anything from steel, brass, glass, etc. AS LONG AS, the material is not “above grade” (raised above the floor surface). Make sure you inspect the floors for anything above grade and either cut off, hand grind to level, or smack with a hammer to knock below grade. Once you’ve eliminated the above grade issues, you can grind it along with the concrete resulting an interesting detail that adds to the personality of the floor. If you DO NOT inspect the floor and deal with the parts above grade before you begin grinding, you will most likely knock your diamond segment off and can do a lot of damage to your machine. What finish am I trying to achieve? i.e. Cream Polish? Salt & Pepper Finish? Heavy Aggregate exposure? What is on the floor now that must be removed before the polishing process can begin? Like epoxy coatings, VCT, Ceramic Tile etc. Most polishing will start with a 40G metal bond diamond to expose the salt & Pepper or aggregate. If doing a cream polish you will almost NEVER start with a metal bond diamond as it will remove the cream, and once it’s gone… it’s gone forever. If removing material like an epoxy flooring before the polishing process do not succumb to the temptation to use a more aggressive diamond like a PCD as it will make deep scratches that are extremely difficult, if not impossible, to remove. When you’re not sure what diamond to start with, err on the side of caution and start with a less aggressive diamond, because you can always drop back to a more aggressive diamond, if need be. When polishing a floor, you must keep an eye on the finish you’re producing as you go. If you see faint scratches starting to appear you must remove them immediately, rather than “hope” the problem will cure itself… because it won’t - it will only continue to manifest as you polish up the floor. For instance, if you are running a 100G resin bond diamond and you start to see scratches, do not think your next step, with 200G resins, will remove them. You must remove them with the 100G or if necessary fall back to a more aggressive diamond like a 50G or 30G resin before you move onto the next step. To reiterate: Remove the problem scratches as soon as you see them. Do NOT leave them and hope they go away… because they won’t and your results will suffer because of it. This may not seem like something that is overly important but in reality it’s incredibly important. Every customer has a vision of how they want the floor to look upon completion- sometimes it’s achievable but not always, so it is important to effectively manage customer expectations. 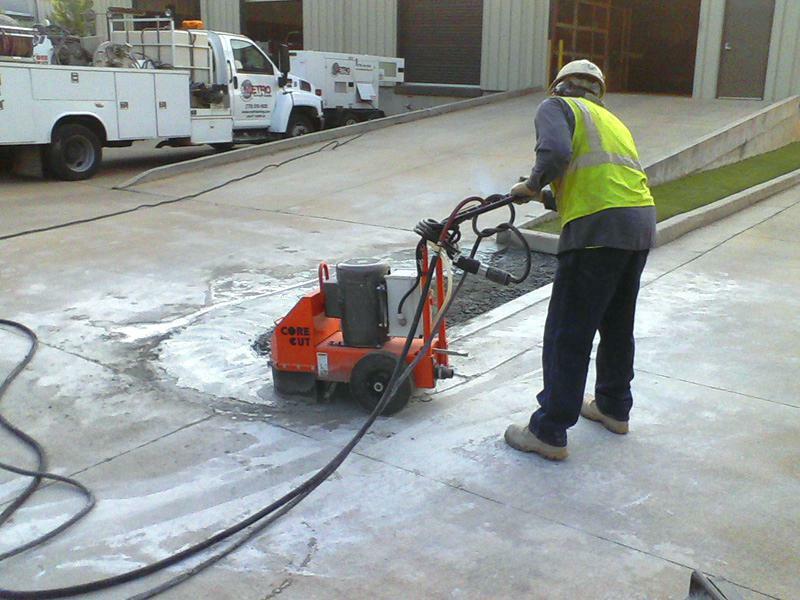 This is often what contractors new to polishing and grinding find most difficult. It is so important to properly educate your customer on what is a reasonable expectation for their floor, because every floor is different and has its own “personality” so to speak. 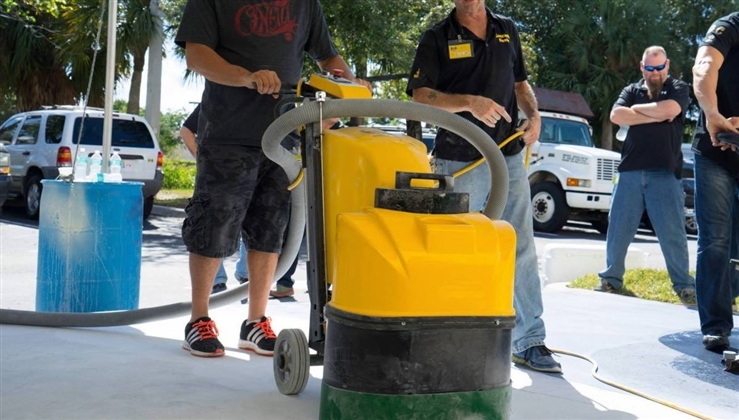 If removing VCT before polishing, you will most likely see a “ghost shadow” of the VCT that will NEVER go away no matter how much grinding you do- and you won’t see it until the polishing part of the job. Be aware of hidden imperfections like spalling, trenches etc. Never promise a consistent monolithic floor (all salt & pepper or all cream finish) promise the opposite, because you will have inconsistencies, cracks, spalling and the like. It is simply the personality of the floor and that is what polished concrete is. If the end user wants a more consistent floor finish, then possibly an overlayment will be required to get the floor to the desired finish..
Again, if you're ever uncertain and need some clarification it is important to reach out to the dealer or manufacturer and get their advice on how to move forward. Original article written by Randy Wheelis.